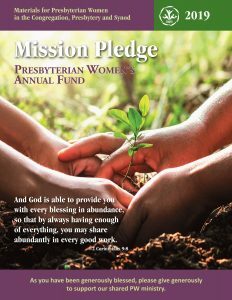 Gifts to the Mission Pledge (PW’s annual fund) make possible the ongoing mission and ministry of Presbyterian Women—from your circle meeting on Tuesdays to the triennial Churchwide Gathering of Presbyterian Women. Your gift enables Presbyterian Women to strengthen the Presbyterian Church (U.S.A.) in the U.S. and around the world. The Mission Pledge helps support the denomination’s evangelism, church planting, education and justice work as well as ministry to children, youth, older adults, new immigrants, rural, urban and suburban populations across the United States and around the world. The Mission Pledge makes possible PW in the Congregation, Presbytery, Synod and Churchwide, as well as PW’s programs, resources, events and much more. The USA Mission Experience, Horizons magazine and Bible study, the Global Exchange, justice work and so much more could not happen without your gift to the Mission Pledge. When you give to PW’s Mission Pledge, you make all of this possible. Your gift to the Mission Pledge ensures that this caring community of women can continue its witness to the promise of God’s kingdom. Individuals may also give by phone or check. Learn best practices for how PW in the Congregations promote, collect and remit gifts to the Mission Pledge. Learn best practices for how PW in the Presbyteries promote, collect and remit gifts to the Mission Pledge. While PW in the Congregations and Presbyteries do the vital work of collecting and forwarding Mission Pledge gifts, PW in the Synods can encourage support of the Mission Pledge by educating women (and men!) about all that PW has accomplished. To ask a question or to learn more about the Mission Pledge, PW’s annual fund, contact Rhonda Martin.